I can’t tell you definitively why we are asked to “say cheese” before a photo is snapped. I checked in the fourth edition of the book, Word and Phrase Origins, by Robert Hendrickson, which did not even include an entry. I then tried Google, but all that came up were assumptions, rumors and myths. The most plausible explanation, mentioned more than once, is that when saying “che-e-e-se” our mouths make a natural smile shape. Whatever. The reason I was looking up the derivation in the first place was ridiculous enough. I thought it would be a pithy opening to writing about the fact that I use quite a lot of cheese in the meals I cook for my sister, Janet, and myself when we are up at our country house each weekend. There is artery-clogging proof in the food journal I started this past summer. For many years, Janet has been keeping a journal in which she makes daily entrees. Primarily, she uses it as a sounding board to work through her feelings and thoughts. I gave up writing in a diary decades ago when I realized I was more or less stating over and over how insecure, inconsistent, and incomprehensible I was. Then, last summer I found a pretty, whimsically illustrated blank journal someone had given me. Why not keep a journal of the food I cook for us in Callicoon, I asked myself? I would photograph the food and have a complete chronicle of our gorging. I thought it would be interesting to see how our fare altered with the seasons and the availability of ingredients. Would there be recurring themes? Yes, indeed. Or, more specifically, a recurring ingredient. In recently perusing the journal, I thanked the stars above that neither Janet nor I have become lactose-intolerant. Interestingly, when Janet was a child, she ate nothing but melted mozzarella on pizza. As the years passed, she cautiously tried other cheeses, but only those in melted form. This I can relate to, having always contended that I would eat an old boot if it were covered in enough melted cheese. Eventually, Janet took to soft, runny cheeses like brie, Camembert, and a ripe, funky Italian taleggio because they were pretty close to seeming melted. Gooey is still her favorite consistency, but I am happy to say that in mid-life she began to experiment more adventurously and willingly eats slivers of Parmigiano-Reggiano shaved atop a salad and the occasional nibble of goat or feta cheese, snuck into a dish. 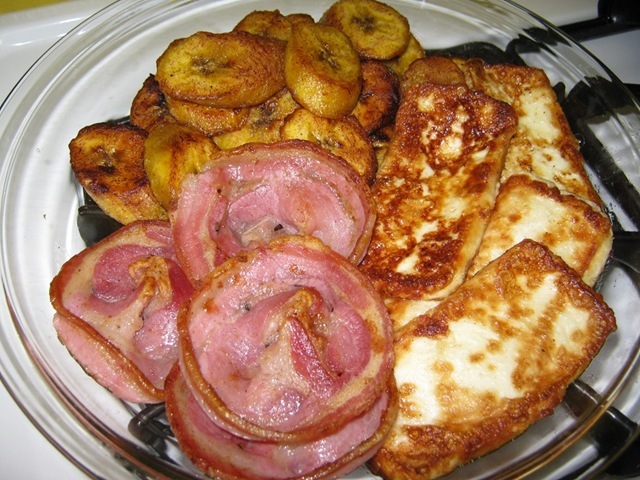 I prepared a Dominican breakfast of slices of crispy salami, two sunny-side-up fried farm eggs; discs of sauteed sweet plaintain; and “fry cheese,” a white, dense cheese introduced to me by a co-worker. It comes in a block, and I slice it into thin rectangles which I place in a skillet coated with a bit of oil. Soon the cheese softens and gets a mottled golden color; it needs to be plated and eaten immediately, as it gets a little rubbery if not swiftly consumed. The fruit salad accompanying the meal was pineapple, watermelon, banana, and fresh chopped mint. I made grilled cheese sandwiches on sesame-encrusted, slightly sweet semolina bread. I used a mixture of taleggio and fontina cheeses and some shredded proscuitto di Parma. With it we had a sliced, deep red heirloom tomato garnished with tiny leaves of bush basil, extra-virgin olive oil, balsamic vinegar, sea salt and freshly ground black pepper. I made pasta shells stuffed with creamy ricotta cheese, spinach, chopped mozzerella, grated Parmigiano-Reggiano, and a pinch of freshly grated nutmeg. 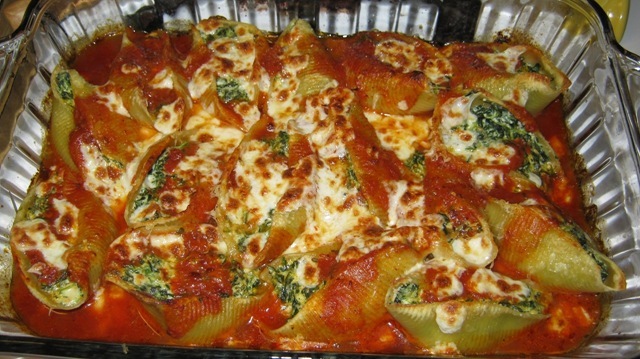 I stuffed the mixture into the partially cooked shells and baked them under a cloak of marinara sauce topped with additional mozzerella and parmesan and slid them under the broiler at the end to crisp the topping. 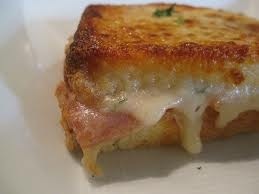 I made a variation on Croque-Monsieur sans Mornay sauce, which would have sent it over the top as far as richness goes. I made brioche sandwiches with honey-maple turkey and taleggio cheese (in place of ham and gruyere), then dipped the sandwiches in an egg and milk bath before frying them in butter to a deep golden brown. With it we had cubed cantaloupe and sliced sweet peaches. 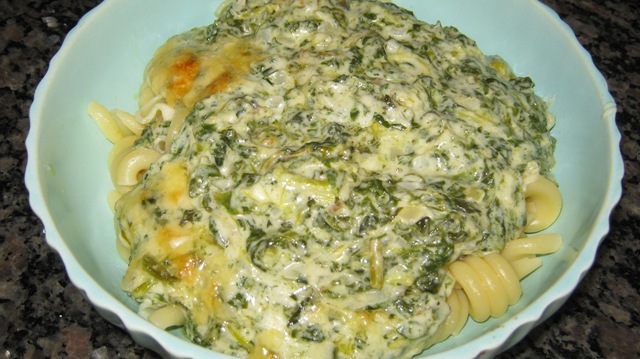 I made one of Janet’s favorite dishes: cheesy (gruyere and parmesan) creamed spinach gratin eaten over pasta. We usually have it over wide egg noodles, but we have about a half dozen boxes of a corkscrew-like pasta Buzz was hoarding before his death and the shape worked well with the dish, as well as being a reminder of Buzz. With it we had a tomato salad with extra-virgin olive oil, balsamic vinegar, sea salt and freshly ground black pepper. Some of the tomatoes – sweet 100’s – were from our own garden, as was the basil. A simple meal of melted fontina and cheddar cheeses on slices of a crusty Portugese roll, watermelon cubes, and paper thin slices of proscuitto di Parma. We had hanger steak that I seared stove-top and served crazy rare, the way we like it. Alongside we had mac and cheese. I made a roux, then added half-&-half and made a cream sauce to which I added sharp cheddar cheese, Dutch gouda, and Parmigiano-Reggiano, and a squirt of tomato paste. I baked it until it was bubbling, then put it under the broiler for a few minutes to crisp the top. A mixed bag. A great spaghetti carbonara – creamy, cheesey, and rich with matchsticks of pancetta that had been crisped in a little skillet and garnished with a healthy grinding of black pepper. The fiasco portion of the meal consisted of cherry tomatoes and one large heirloom tomato from the garden, chopped, and dressed with good extra-virgin olive oil and balsamic vinegar that couldn’t save the bitterness of the fruit or of the fresh basil, also from the garden, that was no longer young and tender. This year’s tomato crop was a total bust. Sometimes we’re in the mood for a particular dish and end up eating dinner for breakfast or breakfast for lunch. 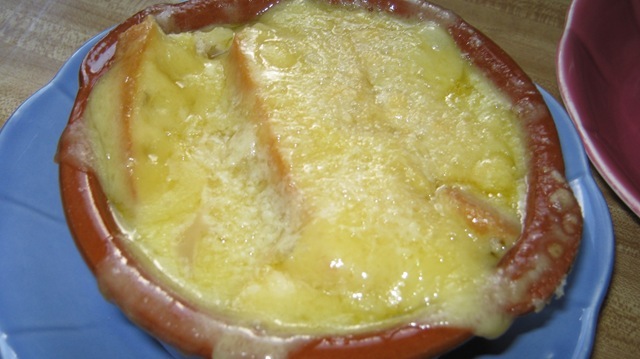 This morning we had French onion soup topped with crusty toasted baguette slices and loads of comte cheese, which is similar to gruyere. I used Madeira in place of white wine, and it added a nice bit of sweetness and depth of flavor. I might have gone overboard with the amount of cheese. Naturally, Janet was in heaven. I made mushroom and cheese enchiladas with whole wheat flour tortillas. I sauteed sliced cremini musrhooms, then grated a mixture of cheddar and gruyere cheese. 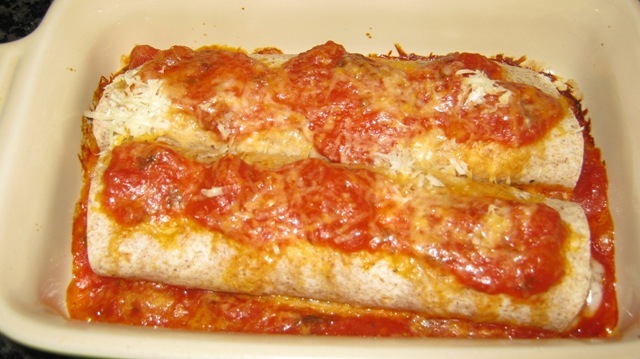 Each tortilla was filled with cheese, mushrooms, and a dollop of bottled salsa, then rolled up and placed in a baking dish with a little tomato sauce beneath and on top. 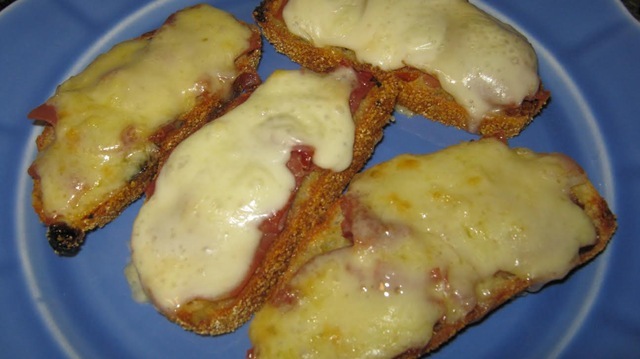 I sprinkled it all with finely grated romano cheese and baked them until bubbly and golden. A couple of years ago, Janet and I ate at Fonda, a wonderful Mexican restaurant in the East Village. For a while, we became regulars and brought friends who were always as thrilled with the food as we were. I ended up writing a review that was published in “The Catskill Chronicle” and was able to wrangle a few recipes from the chef and owner, Roberto Santibanez. One was a dish we couldn’t get enough of, called queso fundido con chorizo, or cheese fondue with Spanish sausage. Smoked paprika is the ingredient in chorizo that gives it a mysterious, haunting flavor. So, I mixed up a batch of margaritas and asked our friends Marci and Smitty over for cocktails. The favorite hors d’oeurve by far was the fundido. I sliced the chorizo into disks that I crisped in a pan, then tossed them in a small cast iron skillet with equal parts cubed Oaxacan cheese (similar to mozzarella) and a mild cheddar and baked it in the oven until the cheeses had melted. I slid it under the broiler for a moment, then served it piping hot with warm flour tortillas and a piquant salsa. Each person scraped some cheese and chorizo from the pan and placed it in the middle of the tortilla, then topped it with some salsa before rolling it up and biting into the chewy, gooey, spicy goodness. That’s it for now. My arteries got more than a little clogged reading through those journal entries. 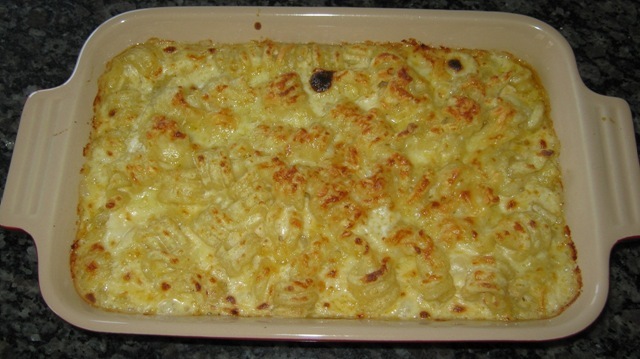 But one final word to the wise: you will note that many recipes calling for a topping of cheese (as opposed to a filling of cheese) benefit from a run under the broiler after the melting process has taken place. This little trick results in a thin crispy, crunchy layer which gives way to the contrasting creamy, gooeyness which makes us, well, smile. Say cheese! I was unable to find Chihuahua cheese, which is traditional in this dish, but a mild cheddar, or even Jack cheese, would be a good substitute. Hispanic markets often carry Oaxacan cheese, which is very similar to mozzarella, so you can use the latter if you can’t find Oaxacan cheese. A small cast iron skillet is the ideal vessel for this dish, since it keeps everything hotter longer. If you don’t have one, any oven-proof ceramic or glass baking dish will do fine. Preheat the oven to 375 degrees. Slice the sausages in half length-wise, then slice each half into thin pieces, a little less than 1/4” in width. 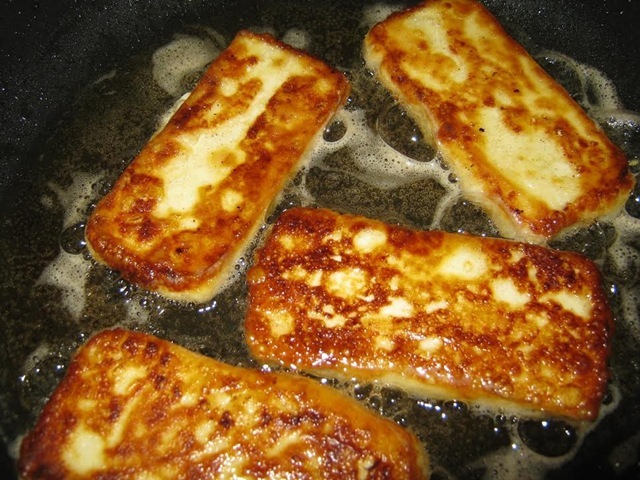 Heat a medium-sized skillet over medium-high heat and add the tablespoon of oil. Cook the sausage pieces, stirring, until the edges get crispy, about 5 or 6 minutes. With a slotted spoon, remove the sausage and place on paper toweling to remove the excess oil. 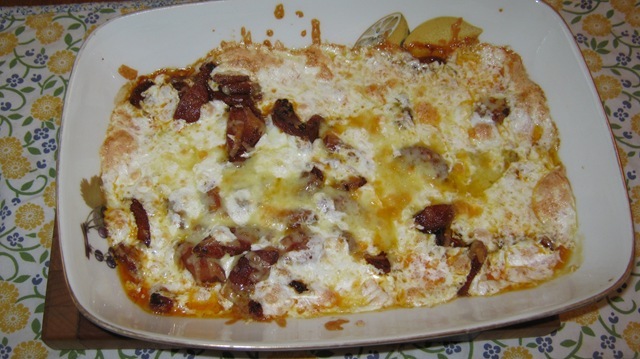 Toss the sausage and cheeses in a small cast iron skillet or shallow oven-proof glass or ceramic baking dish. Bake in the oven for about 15 minutes, until the cheese is melted. While the fundido is baking you can wrap the tortillas in aluminum foil and place them on the upper shelf of the oven to keep warm. When the fundido is ready, place the gratin under the broiler for 2 – 3 minutes until the cheese is bubbling and pale gold. Serve with warm flour tortillas and salsa. My type of post! This is that great dish at Fonda! Thanks for the recipe!